For back cover blurb and more information about this book visit Christina Brooke's website here. Lady Rosamund Westruther has been matched by the Ministry of Marriage to marry Griffith, Earl of Tregarth since childhood. She’s accepted her arranged marriage with decorum and believes in her duty, as all proper ladies should. Until the stubborn, inattentive man refuses to offer her respect, and demands her attendance to his wishes; even though he’s put off their marriage for years since the official announcement of their engagement. Traveling to London to retrieve his obstinate fiancé, Griffith expects to gather his future bride and return to his home without suffering the ridicule or prying eyes of the ton. What he doesn’t expect is Rosamund to flat out refuse him if he doesn’t court her. Griffith knows he’s brutish, and lacks the manners that polite society requires. The idea of paying court to the most beautiful woman he’s ever met seems an impossible task. But something about Rosamund spurs him on, and for some reason this woman seems just as enthralled with him. 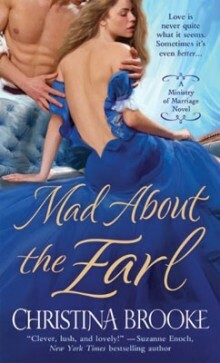 The second installment in Brooke’s Ministry of Marriage series is captivating, and wickedly clever. The author draws you in with her characters, every last one. From a tortured hero and heroine to the villains waiting in the wing, I couldn’t get enough. Rosamund is just as tortured for her beauty and connections, as Griffith is ridiculed for his size and arresting looks. From a visual standpoint these two are polar opposites, internally their similar creatures. Both seek to create a new image for themselves, Rosamund by escaping the ton and becoming a wife, and Griffith by overcoming his insecurities about his image and actions. Add in a viper of a mother, a jilted would-be beau, a murder and you’ve got a jam-packed book from start to finish. Luckily, Brooke doesn’t leave any loose ends. She does a good job of tying up the story lines, and giving everyone a better look at the other members of the Westruther brood; including the male Westruther’s, whom readers haven’t seen too much of yet. My only caveat was that I felt the back end of the book’s pace was a little bit slower than I anticipated. Nothing to throw fits about, but it ruined some of the enchantment for me. Overall, Brooke’s sequel to An Heiress in Love is a good read, and will keep you on your toes. If you enjoy stories that provide lead characters in need of mutual rescue this is a for sure purchase.